I love making bone broth. The smell of home cooked soup filling the house, nurturing both body and soup while it simmered away for hours and hours. 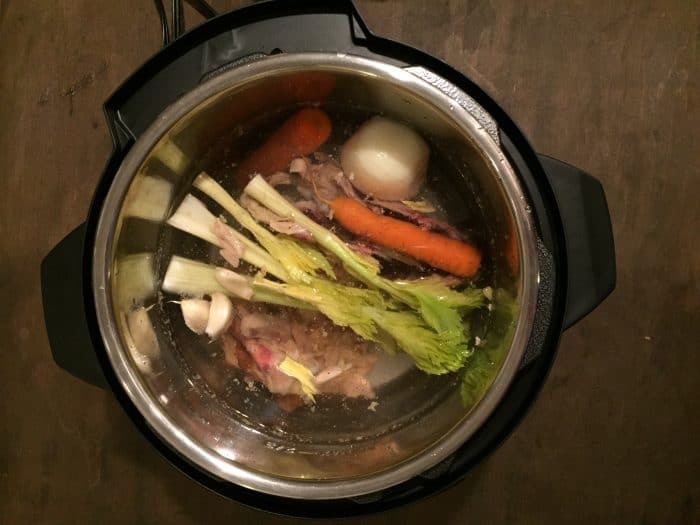 Now that I have an Instant Pot, I love making bone broth even more because it doesn’t take hours and hours (but the house still smells like home cooked soup all day anyway)! 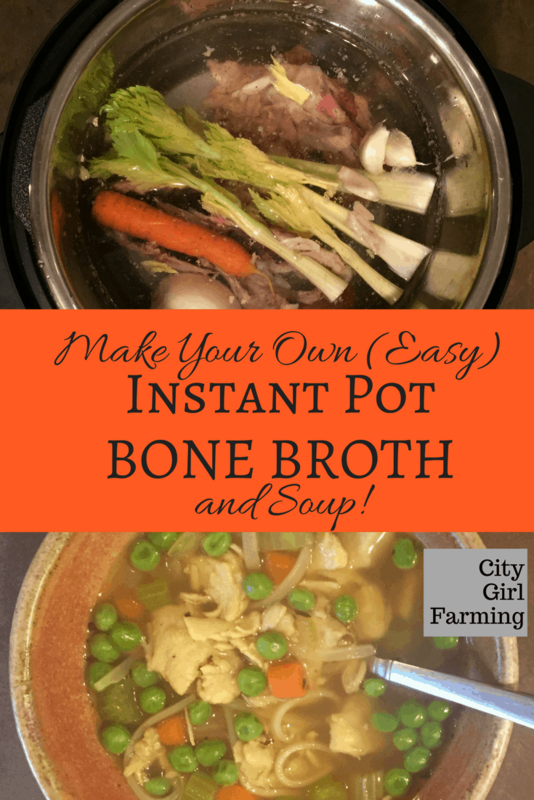 If you have an Instapot, bone broth just got easier peasier than it was before. Herbs and/or seasonings of your choice (optional). You can use raw or cooked bones, and a little meat on the bones adds to the flavor. If using a chicken/turkey, pull the bones apart enough that it can better fit (flatter) into the pot. Add the steamer rack to the bottom of the pot, then add the bones and veggies, and water to cover the bones. If there are too many bones (as in the case of the last turkey I did), you might have to do this process in two batches. You don’t want to overfill the pot. Live life for a while. (I love that the Instapot doesn’t have to be watched carefully like my on-stove-top pressure cooker). When the time is up, I let it release the steam naturally, but if you’re in a hurry, you could manually release the steam if you need to. After it’s cool enough to touch, I grab a big bowl and set a strainer inside of it. I then dump the contents of the pot into the strainer, catching the bones, herbs and veggies. Once the broth is separated, I either freeze it for later, or turn it into soup. 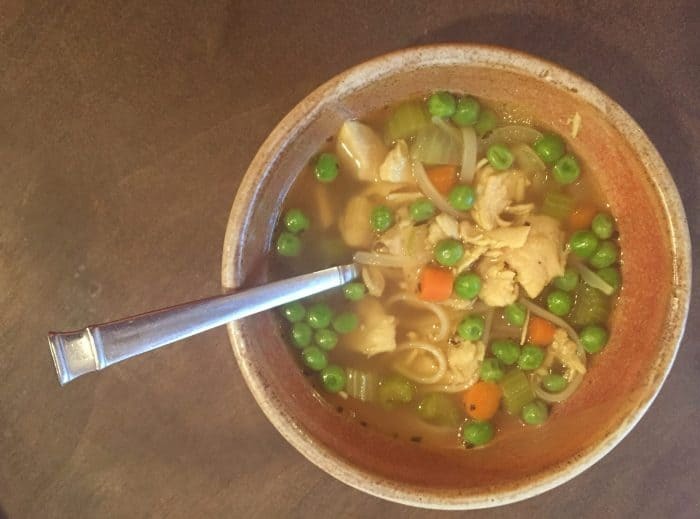 To the Instant pot, I add the chopped up veggies I want–usually carrots, celery, onion, garlic and sometimes broccoli or peas or whatever else I have on hand. Saute these veggies in the Instapot. 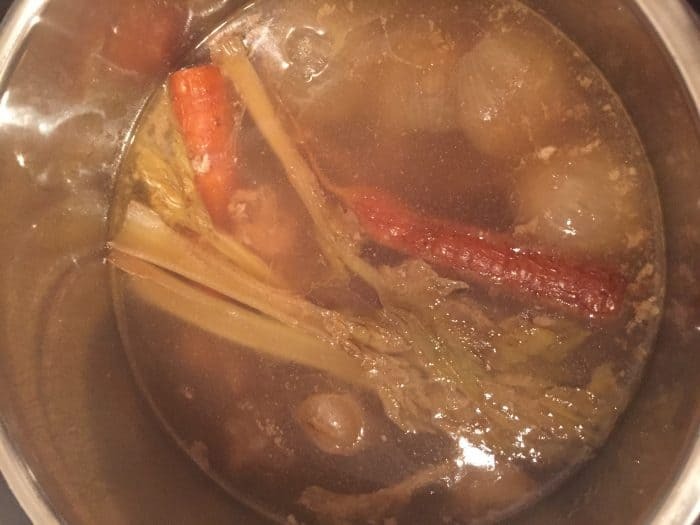 Dump all or part of the bone broth into the pot with the veggies. Add meat, herbs, seasoning, if desired. Continue on saute’ mode until soup is the temperature you’re after the veggies reach the desired softness. At this point the Instant Pot is fairly new in my life. But one thing I love to do with the bones after I make broth is re-cook them until their mush, grind them up and feed them (a little at a time) to the chickens for added protein. I used to do this in the Crockpot and I haven’t converted it to the Instant Pot yet. However, if you’re interested in it, here’s the directions for the Crockpot method. What I LOVE about doing this is that there’s ZERO waste from the chicken and/or turkey. And it’s a free way to boost up protein levels for the flock (which is especially nice in the winter).